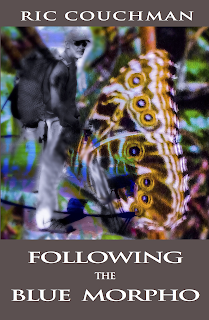 Tormented by the desire to fulfill a childhood dream and with time running out, an artist embarks on an unforgettable journey taking him deep into the Guyana rainforest and bringing him face to face with his own inner self. Compelling, humane, and rich in pathos, this absorbing and masterful narrative reminds us of the power of our dreams and encourages us to follow our vision wherever it takes us. 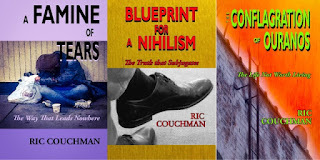 Ric Couchman was born in Georgetown, Guyana. A bright, but average performer in high school, Ric’s interest in serious scholarship began during his seminary years at the Jamaica Theological Seminary. There also began his passion for Literature and Philosophy. 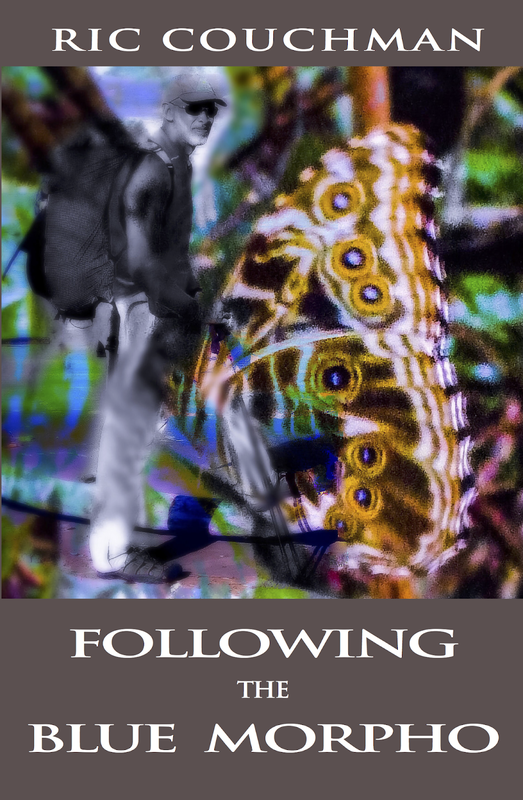 His love of prose writing began in primary school where he wrote his first piece, “Lost in the Jungle”, and his love of writing poetry emerged a few years after college. He credits Guyanese writer, Edgar Mittelholzer, as his inspiration. 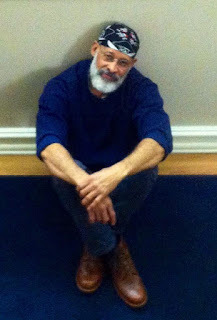 Ric’s intellectual background, his North American residency, his upbringing in the Caribbean, his sole care of four siblings at age eighteen, and his direct exposure to Hinduism, Islam, and Roman Catholicism all inform his writings and influence his unique style and voice. His other books include: 3:00 A.M., Blueprint for a Nihilism, The Conflagration of Ouranos, A Famne of Tears, and Musings from Outside the Universal. And not only should the United Nations Charter be shredded, the representatives of the member states of the United Nations ought to pack their belongings and go home, as the entire body now serves no useful purpose. As the guarantor of peace and stability among member states and as the upholder of the principles of international law, the United Nations has failed us. It has failed to hold responsible and to call to account the American regime along with its vassal British and French regimes for their recent act of aggression against a sovereign member state (Syria) of the United Nations, a criminal act, an act that is in contravention of the United Nations Charter since it was carried out unilaterally and without a mandate from the United Nations Security Council. These three rogue states, in virtue of their breach of and their utter disregard for international law, have shown the rest of the world that they can act with impunity and that there is no institution or nation state that can do anything about it - certainly not the United Nations. Sadly, then, it means that in our current world no international norms or rule of law exist. The American regime (in consort with vassals Britain and France), arrogating to itself the role of acting on behalf of the international community and the role of world policeman under the pretext of questionable neo-humanitarianism, has shown that it is a law unto itself and that it will impose its will on the international community whether its members like it or not. In sum, the only right that now exist in our world today is the might of the American regime, and the only law operative in our world today is the will of the American regime. And any nation of the world that resists its might and will, does so to its own peril. A sad state of affairs indeed. 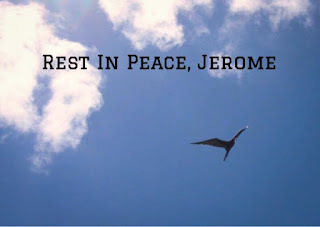 Jerome died on Wednesday afternoon, savagely stabbed multiple times and left lying in his blood in Bourda Market. I wanted to know the exact spot where he died and to find out the kind of person he was, so I went around the market making inquires. The general sentiment of the vendors to whom I spoke was that he was a good and helpful person. Lenny pointed out Jerome's friend to me, Judah. Judah was the last person to speak with Jerome as he lay dying in the market. Judah showed me the spot where his friend fell and re-enacted how he knelt down beside his friend asking him, "Who did this to you?". Like the vendors to whom I spoke, Judah had nothing but good things to say about his friend. Jerome was a "vagrant". That was how the news media characterized him in the newspapers the next day. That is how the individuals and groups who gave him food from time to time charactize him. That is how those to whom we have given the mandate of managing the affairs of State characterize him. That is how the Guyanese people characterize him. A "vagrant". And we do not have in view the word's denotation, its dictionary definition. We have in view the word's connotation, its meaning beyond the dictionary definition. He was a "vagrant". For us then, that means he was odious, disgusting, nauseating, criminal, loathesome, reprehensible, despicable, idle, purposeless, burdensome, scary, an object of scorn, a blight on our society. That's how we think of Jerome and "his kind". Before we even knew him we had already marginalized him, judged him, and passed sentence on him, in the same manner we have done the other "vagrants". Jerome was killed around the same time I was hanging out with some other "vagrants" just around the corner. He made the news. And it was the only time he was brought to the public attention, into the public consciousness (assuming we read it in the newspapers or heard it over the radio or TV network). And sadly, he made the news only because he was killed. In fact, that seems to be the only way in which a "vagrant" would make his or her way into the public consciousness. He had to be violently killed or be found dead in a trench. And sadly, he remains in our consciousness for but a moment, for he is soon passed over and forgotten. The "vagrant's" daily struggle and suffering on Guyana's streets is not newsworthy because such struggle and suffering is not important to us. Or, it has lost its importance because we have become inured to it, leaving in place an insensitivity and a callousness. Jerome became more important in death than he was in life not because of our desire to celebrate his "hapless" life but because of our desire to satisfy our curiosity, our morbid appetite for salacious details about the violent snuffing out of a life and with a vulturous and insensitive media only too willing to oblige, offering us mere spectacle and show while we watch uncaring, unfeeling, and unthinking. And at the place where the "vagrant" met his terrible death all is forgotten, life goes on, the market is back to business. One fewer "vagrant" to deal with. The news media awaits another story. We return to our day to day. Even his fellow road people, of necessity, must move on, for they cannot afford the luxury of lingering in collective sadness as they must continue to focus on their own survival. And so, Jerome, the "vagrant" is summarily forgotten. I believe that every step we take towards humanity, however small that step is, is a step in the right direction. Every attempt to mobilize others to take that step, every smile offered, every encouraging word, every caring touch (a hand on the shoulder, a handshake), every act of kindness, it is a step in the right direction. If the freedom of the street dweller is assumed (the freedom to make choices and to accept the consequences negative or otherwise), then that pre-supposes my freedom also - my freedom to show compassion to her (or not), to feel sorrow for her (or not), to extend a helping hand to her (or not), to "save" her however illusory (or not), just as that individual is free to choose to accept or reject my gestures. If you are free to judge the street dweller's merits, or to speculate about his circumstances or motives, or to form conclusions (without evidence) as to his character (for example, that he is lazy), or to put forward the exceptio probat regulam, or to hold that tough love is the requisite response, allow me the freedom also to defer analysis, to assume his good intentions, to assume his weakness in the face of his overwhelming circumstances, to figure that it is not simply a matter of his manning the f#@k up and suddenly receiving clarity of mind from some tough love approach. Allow me the freedom to care. It was important to Shaun that I understand that he didn't smoke. 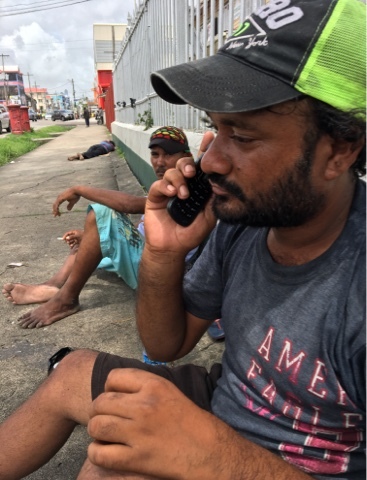 He told me repeatedly that he didn't smoke, and on many occasions while I sat with him he would appeal to his fellow street dwellers as they passed by for confirmation of that fact. 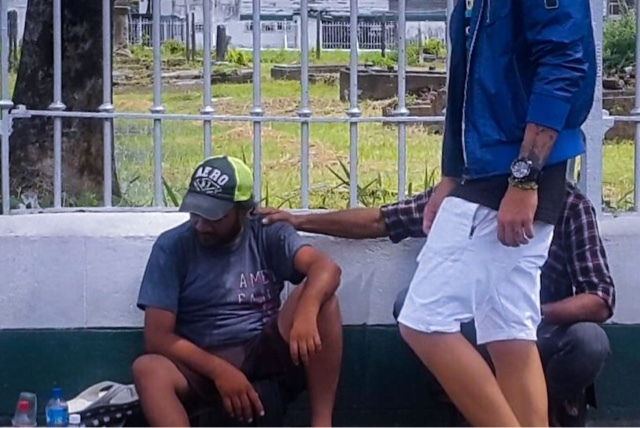 Shaun is living on the streets not on account of the usual assumptions we might have, namely, alcohol abuse, drug abuse, too lazy to work, or mental challenge. He is living on the streets because he is too ashamed to face his wife and two young children, Paul and Leah. Why is he ashamed? He is ashamed because he cannot provide for them? Why can he not provide for them? Three years ago he suffered a terrible injury to his left wrist that left his left hand paralyzed - an injury that has not healed to this day and that seems to be getting worse. For Paul, not being able to work is an evisceration of his manhood. Shaun is from Black Bush Polder where his mom, his wife, and his children currently reside. He has not seen them in three years. This was the fourth time Shaun and I were meeting. He had asked a few days earlier whether I had a pair of used pants, a shirt, and a pair of sneakers to spare as he wanted to go to the hospital to get his wrist checked out. I provided the pants and shirt and my friend Roberto provided the sneakers. Roberto and I had arrived to drive him to Black Bush Polder to visit him mom and his family. The day before, I had asked him whether his mom and his wife had access to a phone and if he wanted to talk with them. He remembered his mother's number. I called the number, and a woman answered. I put Shaun on the line. It was his mother. What followed was the most heartbreaking phone call I ever heard. Shaun was in tears, and at the other end the tears and anguish were obvious. At one point Shaun asked, "Ma, what did you cook?" Pause. Tears. "Ma, and your son is living on the street with nothing to eat. I am coming home, Ma. I am coming home. I am coming to see you and Paul and Leah." In the end, Shaun's shame proved far stronger than his desire to see his family. When Roberto and I showed up and asked if he were ready, he said that he couldn't do it. His wrist was bandaged, and the viscous, yellowish, white fluid could be seen oozing through it. I did not press the issue as I wanted to leave the choice entirely to him. I understand his change of heart. One does not peel away three years of shame and guilt in an instant, but talking to his mom for that brief moment was, for him, priceless. In the meanwhile, to numb the feeling of shame and guilt that he carries like an albatross around his neck, Shaun drinks high wine. For "what else is a man to do," he says, "with all that time on his hand to sit and think of the pain, the hurt, the suffering, the shame?"